Il était une fois, un pays, vieux de quelques milliers d’années, qui s’appelait Palestine, où il faisait bon vivre. Toutes les communautés, ethniques et religieuses, y vivaient en totale harmonie. Toutes et tous, étaient des palestiniens. La facilité avec laquelle la mauvaise conscience européenne se montre efficace dans le fait d’abandonner les Palestiniens à leurs souffrances oblige à répéter ces évidences : les Palestiniens ne sont pour rien dans les crimes antisémites, les gendarmes qui ont procédé aux rafles des juifs dans le métro parisien, en 1942, pour les envoyer dans les camps de la mort, étaient des Européens. Les directeurs d’écoles qui ont livré à la Gestapo les listes d’enfants juifs inscrits dans leurs écoles, avant même qu’on le leur demande, étaient des Européens ! Vous avez menti, en expliquant à vos opinions publiques que les palestiniens ne sont que vils terroristes cherchant à tuer le juif ! Vous avez menti en n’expliquant pas à vos enfants l’histoire véritable du conflit. Vous avez condamné tout un peuple jadis heureux à errer sans droit dans les camps de refugiés. Vous avez dénigré tout un peuple pacifique, volé et saccagé son patrimoine, omis de dire qu’il disposait d’une vraie culture, oublié que ses érudits écrivaient de la poésie et des romans d’amour, traduisaient en arabe les livres étrangers de philosophie, science et politique, mais aussi des pièces de théâtre comme celle d’Hamlet, traduite et joué en arabe à Jérusalem en 1936 par une femme ! Le peuple de Palestine, peu importe où il se trouve, n’est pas naïf : Vous continuez de soutenir aveuglement l’État d’Israël, un État que vous aviez vous même « exceptionalisé » en lui délivrant un permis permanent de tuer ! En supposant que vous ayez encore le moindre pouvoir sur votre protégé Israël, vous venez d’autoriser un massacre de plus à Gaza ! Celui-ci se déroule en Palestine devant le monde entier. Le peuple palestinien n’a pas encore fini de panser les blessures du massacre précédent, en 2008, où quelques milliers de palestiniens ont été tués par les bombes à phosphore ! Votre soumission au sionisme et à l’État d’Israël pour les raisons qui sont les vôtres vous rend coupables de ne pas chercher la vérité ! C’est pourquoi le peuple palestinien vous déclare coupables de l’avoir abandonné. L’avidité du puissant israélien le laisse penser que de massacre en massacre, Israël accomplira ainsi son destin. Ce(tte) œuvre de Nabil El-Haggar dont la source est le site de l’UJFP est mise à disposition pour sa copie à l’identique selon les termes de la Licence Creative Commons Attribution - Partage dans les Mêmes Conditions 3.0 non transposé. Considering your positions, actions and statements and assuming that great and honest men like you can only be sincere, I came to the conclusion that you are prevented by your political cultures from seeing the truth about the so-called Israeli-Palestinian conflict. Please allow me then, in all modesty, to clarify this issue for you. Once upon a time, there was a country a few thousand years old where life was good. It was called Palestine. Different ethnicities and religious communities lived together in perfect harmony. Everyone living there was Palestinian. Six thousand kilometers away, Europe bred anti-Judaism then turned it into anti-Semitism. Europe created Nazism. So, you see, it is Europe that is, in fact, responsible for the centuries-old discrimination toward its Jewish people, first decried as "deicidal" and later as "pariah". Over sixty years ago it was Europe, again, that sent six million Jews to their death. However, the ease with which you, as world leaders, condone Israel’s repeated attacks on the Palestinian people could lead us to believe that the Palestinians are condemned to pay for Europe’s anti-Semitic crimes. Europe’s guilty conscience would rather forget the Palestinians’ suffering. So let me refresh your memory: Palestinians are innocent of any anti-Semitic crimes: In 1942, the policemen who arrested Jews in the Paris metro and had them sent to death camps were European. The principals who, before even being asked, delivered the lists of Jewish children attending their schools right into the Gestapo’s hands were European! The Palestinians are victims, too. They deserve your respect! Because the colonialist West, of which you are the heirs, decided to create a Jewish state on Palestinian territory, and because this state, in turn, organized the social genocide of the Palestinian people and society in violation of human rights, you are duty-bound to acknowledge the wrongs done to the Palestinians, to take responsibility and to offer them protection and respect. You are guilty of not showing any respect to Palestinian victims, many of whom died during the Palestinian exodus known as “Nakba” (the “Catastrophe”), and many more later, slaughtered at the refugee camps of Sabra and Shatila, in Beirut. You are guilty too of the hardship endured by Palestinians for over 65 years. Worse still, you declared that Israel has the “right to defend itself", leading people to believe that a country with one of the world’s top military and technological powers, could be threatened by Palestinian rockets. In doing so, you have become the representatives of a war-waging monster that is not only destroying thousands of homes and tearing up thousands of age-old olive trees, but also killing, jailing, torturing, deporting and humiliating children, women and men. This isn’t only happening to Palestinians living in Gaza, but wherever Palestinians are to be found, including to those holding the Israeli citizenship. Palestine and millions of Palestinians are the victims of Israel. In truth, they are your victims, too! Your predecessors have robbed a country and forced its inhabitants into exile, condemned them to death or, at best, to a life in refugee camps! You have lied by telling the world that Palestinians are evil terrorists whose only purpose is to kill Jews! You have lied by not telling your children the real story behind this conflict. Once a happy people, you have turned Palestinians into refugees without any rights. You have disparaged a peaceful people, robbed and destroyed its heritage, ignored its culture. Yet, its scholars used to write poetry and love stories, translated into Arabic foreign books about philosophy, sciences, politics, and plays too: Hamlet for instance, was translated and played in Jerusalem in 1936, what is more, by a woman! In complete disregard of the resolutions taken by the international community, in other words by you, Palestinians have been prevented from returning home for the past 65 years. This is in violation of the most basic of human rights. The truth is, when it comes to Israel, you haven’t the least respect, not even for your own statements, and less still for your principles. Palestine has been wounded and raped a thousand times; now it feels tired and weak. How could Palestine ever count on you for help? Palestinians, wherever they are, are not naive. You continue to blindly support Israel; a state with a permanent "license to kill" delivered by your own hands! If it is true that you still have some influence over your protégé, Israel, then you have just authorized a new massacre in Gaza! It is taking place in Palestine, before the whole world. Palestinians are still recovering from the 2008 massacre, when thousands were killed by phosphorus bombs! Nevertheless, you are convinced the massacre you have just authorized is inevitable, if not downright legitimate! President Obama, didn’t you declare that Israel has the “right to defend itself"? As Nobel Peace Prize winner, didn’t it occur to you that Palestinians, too, have the right to defend themselves? The right to defend themselves against occupation, against a dividing wall that belongs to another age, against arbitrary acts, against the Jewish settlements, against the destruction of their homes, against the evictions, against the murders and the detention of children who have been suffering for so many years? Don’t Palestinians deserve your protection? Don’t they have the right to live peacefully? What you deem as normal, or even legitimate, is in fact Israel’s determination to rid Palestine of Palestinians, once and for all. In other words, after the first “Nakba” in 1947 and after succeeding in provoking a second “Nakba” following the signature of the Oslo agreement, it looks like Israel is preparing a third “Catastrophe” by confiscating what is left of Palestinian territory, killing its youths, breaking their resistance with the ultimate goal of emptying Palestine and destroying it. Your subservience to Zionism and to the state of Israel, for reasons only you know, has made you blind to the truth. Therefore, the Palestinians declare you guilty of deserting them. Greed leads Israel to believe that each new massacre will bring it closer to achieving its destiny. However, you need to understand this: The state of Israel will achieve legitimacy only if bestowed by the native people of Palestine. Ce(tte) traduction inédite en anglais de Nabil El-Haggar par Alba Gowen dont la source est le site www.criticalsecret.net est mise à disposition pour sa copie à l’identique selon les termes de la Licence Creative Commons Attribution - Partage dans les Mêmes Conditions 3.0 non transposé. 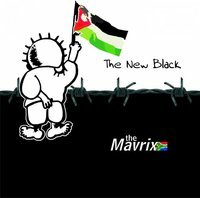 Le logo est extrait du MySpace du groupe de Johannesbourg (Afrique du Sud), The Mavrix, auteur de la chanson The New Black, en solidarité avec Gaza. (Hanzala from Naji al-Ali / Hanzala est un personnage emblématique de la résistance palestinienne, imaginé par le caricaturiste Naji al-Ali, membre du FPLP, assassiné à Londres par le Mossad en 1987). Rapport sur la quatrième et dernière session en date du Tribunal Russel Pour la Palestine (TRP) qui a achevé ses travaux à New York, le 7 octobre dernier ; par Suraya Dadoo, chercheure pour Media Review Network, Johannesbourg. (Source France Irak).